Eltronicschool. - Do you want to make by your self digital stop watch using digital component not microcontroller? In here, we will give you one kind of circuit schematic of digital stop watch using popular components these are NE555 and MM74C926 as the main components in this circuit like in Figure 1. below. 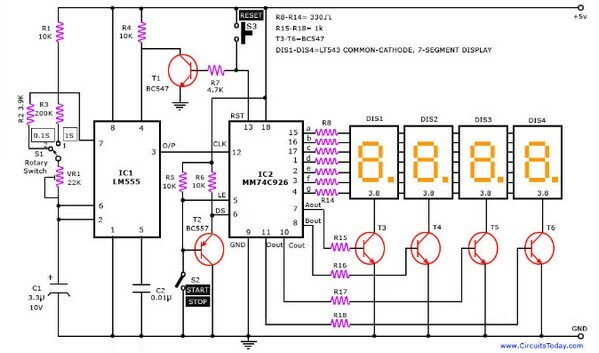 Circuit schematic like in Figure 1. above is Circuit Schematic Digital Stop Watch using NE555 and MM74C926 IC. According Circuitstoday site that published this circuit describe that A digital stop watch built around timer IC LM555 and 4-digit counter IC MM74C926 with multiplexed 7-segment LED display. MM74C926 consists of a 4-digit counter, an internal output latch, npn output sourcing drivers for common cathode, 7-segment display and an internal multiplexing circuitry with four multiplexing outputs. The counter advances on negative edge of the clock. The clock is generated by timer IC LM555. The circuit works off a 5V power supply. It can be easily assembled on a general-purpose PCB. Enclose the circuit in a metal box with provisions for four 7-segment displays, rotary switch S1, start/stop switch S2 and reset switch S3. Now you can read more the article with the title ACircuit Schematic Digital Stop Watch using NE555 and MM74C926 IC using link here.